DUBAI, United Arab Emirates – The Middle East Broadcasting Center (MBC) is an independent entertainment pan-Arab television and radio network targeting the Middle East and North Africa audiences. MBC currently has 17 television channels, with programming that includes 24-hour news, 24-hour movies and 24-hour music, as well as entertainment for Arab women, children’s entertainment, and general family entertainment. Since 2012, MBC has been upgrading the audio systems in its Dubai and Cairo studios with HARMAN Studer Vista digital mixing consoles. To help find the right solution for its particular needs, Bacho and MBC turned to regional distributor GSL Professional, which recommended Studer’s Vista Series consoles. “We have had a very long, solid relationship with Studer, having used their products since 2002 when our Dubai Media Center studios opened. The products have shown great stability along with the flexibility needed for workflow, and console architecture was also something that set Studer apart from the competition,” Bacho noted. MBC’s first step was the purchase of a 62-fader Studer Vista 9 digital console for its Al Arabiya news channel, based in Dubai Media City. Al Arabiya is a free-to-air channel, providing news, current affairs, business and financial markets, sports, talk shows and documentaries. A year later, in 2013, MBC upgraded its control rooms at MBC 1, a free-to-air, pan-Arab general television channel, also based in Dubai Media City. For this location, GSL Professional supplied two Studer Vista 9 consoles. One Vista 9 has 52 faders while the other features 62 faders. With Vista 9 consoles now in three main control rooms at MBC in Dubai Media City, and with each control room serving long hours of news and other programming, MBC had the confidence in Studer to continue expanding with the Vista platform. So later in 2013, MBC upgraded the Dubai Media City-based control room of its MBC 3 studios, which exclusively provide children’s programming. However, this time MBC opted for the compact—yet powerful—32-fader Studer Vista 1. “Our familiarity with the Vista 9, not to mention our enjoyment in using the consoles, made the Vista 1 a great fit for our upgrade at MBC 3,” said Basheer Saad, Sound Engineers Supervisor of MBC. In 2014, MBC added a 32-fader Vista 1 console to its Dubai Media City studios for Al Hadath, a free-to-air news and current affairs satellite channel, which operates as an extension of Al Arabiya. In addition, MBC’s news bureau in Cairo is also equipped with a 32-fader Vista 1. 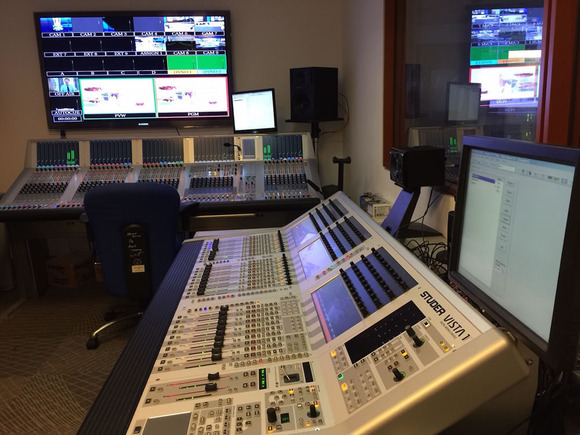 Utilizing Studer D21m I/O systems, MBC has connected each of the consoles in its Dubai Media City studios via MADI—a worldwide standard electronic communications protocol—to share sources and provide redundancy. Since the Vista 9 and Vista 1 consoles are built on the same platform switching between the studios is an effortless task. In addition, with an upgrade to Vista software version 4.9, MBC has benefited from the Studer VistaMix feature, which is an automated microphone mixing algorithm based on gain sharing for simplifying the mixing task at multi-contributor events. VistaMix removes the need for an operator to manually adjust all the faders all the time, leaving the microphones of talking participants open, while closing the microphones of silent participants in order to reduce spill and background noise. “VistaMix is a great tool to reduce the noise coming from the newsroom, which is an open area, in talk show programs with multiple presenters and guests on the air,” Saad said. MBC has also benefited from Studer’s proprietary FaderGlow™ technology, which illuminates each fader in the color relating to the relevant function, creating an instant overview of console status. The Studer Vista consoles have provided a reliable and high-performance platform for MBC, enabling the engineers at the network to operate efficiently and effectively while sharing information in real time. “The Studer consoles have definitely met our needs so far, as evidenced by the fact that we have continued to upgrade our studios with Vista consoles,” Bacho said. “We have had great experience with Studer in terms of audio quality, workflow and support.